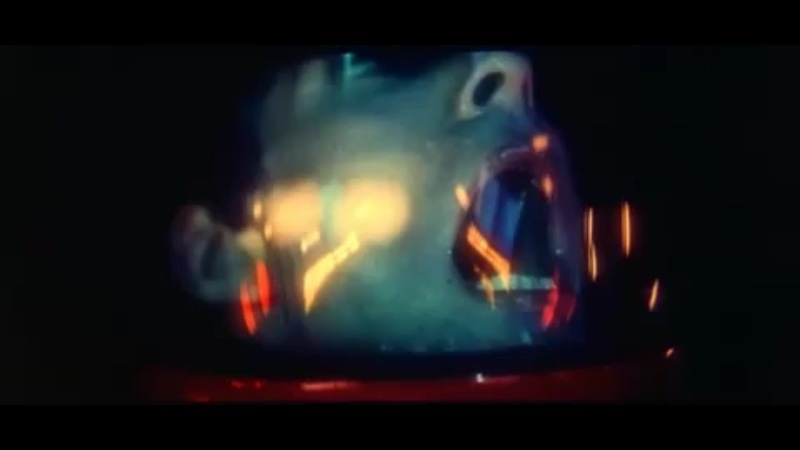 There isn’t a note of original music in 2001: A Space Odyssey. Every note on screen, from the weirdly shifting overture to the jazzy future news theme, was written not for a film, but for the concert hall or the theatre or the radio. Stanley Kubrick chose—to the enduring shock of film composers and students of film music—to entirely ditch an original score. Instead, he used orchestral and choral works that already existed, and sculpted film and music so it fit as well as any original score could. There are four composers on the score: the Viennese Romantics Johann Strauss Jr and Richard Strauss (no relation), Aram Khachaturian, a Soviet Armenian whose music probably comes closest to sounding like a traditional movie soundtrack, and the avant-garde Hungarian composer Györgi Ligeti. The Strausses’ memorable hooks are probably what most people think of when they think of the music in the film, but Ligeti’s music is more than half the score. 2001 starts with Ligeti. 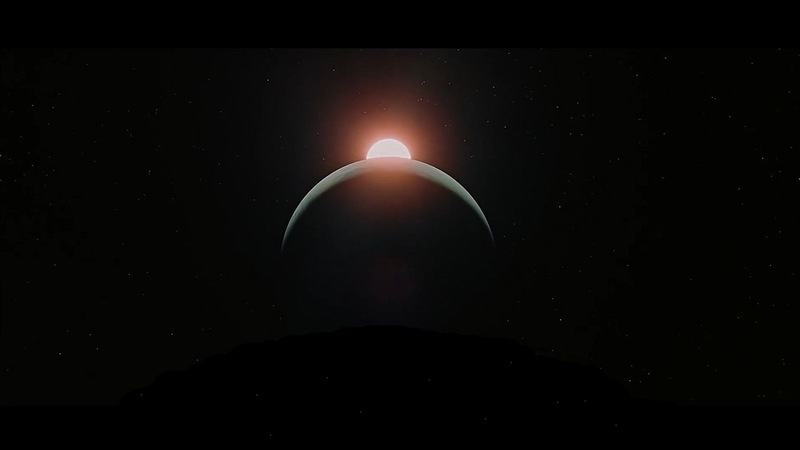 In blackness, his orchestral work Atmosphères plays over the first three minutes of the film, before even the studio logo appears. It’s not an introduction, but an overture. It’s music to set the mood. You could unkindly call it a “noise killer”, urging the audience to silence. It would just be that, if it weren’t also setting up for a big musical payoff much later. Very few Hollywood blockbusters are brave enough to open with music so insistently dissonant. Atmosphères is like a gentle orchestral chaos. But Ligeti chose his notes as carefully as Kubrick chose his shots. In the early ’60s, the composer was developing a technique he called micropolyphony. Instead of playing together, every musician in the orchestra gets a tiny, fragmentary melody or a long tone. The tones and melodies pile onto one another to make dissonant, densely clustered chords, kind of like when you rest your arm on a piano keyboard. But the chords aren’t static. They pulse and shift. Kate McQuiston, author of We’ll Meet Again: Musical Design in the Films of Stanley Kubrick,[Amazon U.K., U.S.] notes the similarity to impressionist painting, “whose component parts cohere only when the viewer stands at some distance.” You don’t hear the individual melodies, like you don’t see the individual brush strokes, unless you look very closely. They’re the method, not the product. The result is a broiling froth of sound. From its midst, as the screen changes from black to MGM-blue, we hear a rich, still, simple C. It’s order from chaos; from Atmosphères, the prelude of Richard Strauss’ half-hour tone poem Thus Spake Zarathustra. [In the novel,] humans are the link between apes and a new type of being, what Nietzsche calls the Übermensch, or superman. This concept of the development of the human into a being that has achieved its full potential is particularly resonant in the narrative of 2001… Kubrick was not much concerned with the story [of Thus Spake Zarathustra], but… it fit rather well. There aren’t many openings in music more famous than this one. It’s built on a phenomenon called the overtone series. Most instruments, when they play, produce more than just the notes you hear. There is almost always a pattern of overtones, half-subconscious notes above the ones being played. When other instruments play higher notes, they match the overtones and create harmony. When they play different notes, they clash and create dissonance. The latter is what makes Atmosphères work, by the way: it’s a complex web of clashing notes and overtones. The prelude of Thus Spake Zarathustra has the opposite goal: absolutely matching overtones. After that first C, four trumpets together play C–G–C–E. That’s the overtone series for C, taking what we already hear subconsciously and spelling it out explicitly, one note at a time. The harmony is fundamental, but the setting makes it grand. The four-note climb returns twice more, each time bigger than the last. The first climb yanks the top E right out for an E flat, making a chord of C major, falling instantly to C minor. The second reverses it—C minor, then immediately major—so it’s brighter and bolder as well as bigger. At the highest peak, the pair of chords are drawn into a full melody, a vast climax as the title of the film appears. On screen is an image just as primordial and majestic: three spheres on a black canvas, each bigger than the last; a syzygy, Moon, Earth, and Sun. The sound of the last grand chord diminishes and decays over images of the African plains as the first act opens. Music, which had been so prominent until now, vanishes for the next six minutes as we see life in pre-human society. It’s only as the ape-men of the first act encounter something not of their world that music returns: the monolith, the black slab that recurs through the film, appears in their midst. Alien voices seem to pour from it, singing eerily, and it’s unclear whether they’re in diegesis—in the world of the film—or part of the soundtrack. It’s another Ligeti work, Kyrie from his Requiem, written for soprano, chorus, and orchestra. It uses micropolyphony, like Atmosphères did, but this time the individual melodies are easier to make out because they’re sung rather than played. They merge and weave and overlap, building to a shrill peak as the camera looks up from the bottom of the monolith at the moon and sun, aligned in syzygy over the mysterious artefact. The film comes to focus on Moonwatcher, a member of the ape-man tribe who saw the monolith. He picks up a bone, slowly realising that it can be used as a weapon, raising it high over his head to pulverise an animal skeleton. The prelude of Thus Spake Zarathustra returns. It feels ironic and sincere at the same time, a profound moment in evolutionary history and a primitive act. When it’s over, the rest of the act, including the first murder, plays without a soundtrack. As it ends, Moonwatcher triumphantly throws his bone into the air. Act Two, in one of the most famous match cuts in cinema, opens on a nuclear satellite. Kubrick’s decision to use existing recordings instead of a traditional score began in the second act. An appropriate piece of music wound up accompanying the first scene by happenstance. Its presence—and the idea of using existing music as a score—spread from there. As a shuttle crosses space and docks with the satellite, we hear Johann Strauss Jr’s famous waltz, The Blue Danube. “It’s hard to find anything much better than The Blue Danube for depicting the grace and beauty in turning,” Kubrick explained later. Waltzes are danced, of course, as rotation and orbit. If the spacecraft can be said to be the dancers in this scene, it is the humans that seem, literally, out of step and behind. For the travellers in 2001, the necessity of relinquishing familiar gravity entails slow, ungainly movements and clunky compensatory measures—for example, the movements of the flight attendant in Velcro shoes. Her tentative steps in the long, narrow aisle of the space plane suggest the feat of a tightrope walker. The scene carries on alternating between the docking spacecraft and the people on board, for over five minutes. It’s the longest single piece of music in the film so far. It’s also centre stage, not accompaniment so much as an equal partner in the scene. Music and visuals are the whole of the action. The Blue Danube is made of five shorter, linked waltzes, with an introduction and a reprise. Kubrick uses it twice, first as the shuttle docks with the satellite, and later as the satellite lands on the moon. The scene between them, where we meet Dr Heywood Floyd, feels more like an interlude in the music and dance of the spacecraft than the other way round. The first Danube scene ends as the bright fourth waltz closes, cutting abruptly to silence in the satellite interior. The second scene picks up from the beginning of the second dance—the same music Strauss used to begin the reprise—and plays through to the end on the ponderous landing. The second waltz scene ends at a conference—another cut to a sort of silence—where we learn about a mysterious artefact that’s been excavated on the dark side of the moon. The soundtrack darkens. As Floyd’s shuttle crosses the lunar landscape, we hear another Ligeti work, Lux Aeterna, for unaccompanied choir. The last time there was a choir singing micropolyphony was Kyrie, when the monolith appeared in prehistoric Africa. The similarity of Lux Aeterna is a clue for the audience. We know what Floyd’s team will find. After more than ten minutes of Strauss, a ninety-second visit to Ligeti’s sonic landscapes is shockingly short and dissonant. The Blue Danube stopped for an intermission, where we met Dr Floyd. Lux Aeterna takes a sandwich break. Like The Blue Danube, Lux Aeterna resumes for the second leg of the journey. This time, it doesn’t stop. As Floyd’s team arrive at the monolith, it runs directly into Kyrie. The extract of Lux Aeterna in the film resembles Kyrie, but it’s less dense, more ethereal. The change is the moment of arrival. This is the second time we’ve seen the monolith, and the second time it’s been accompanied by Kyrie. It’s clear that Kubrick is using it as a sort of leitmotif—a musical idea that represents something in the film. A composer would develop their leitmotifs by changing the rhythm or tonality or speed, techniques that were obviously unavailable to the director. But, as we’ll see, Kubrick had other options. Like before, Kyrie builds in intensity over a couple of minutes. For the second time, characters gather round the monolith, but Moonwatcher’s tribe gathered in adulation; Floyd and the other scientists gather for a group photo. The music creates tension, like seeing the killer in the background. Kyrie doesn’t end or stop, like earlier music. A noise overwhelms it and everything else, the high-pitched shriek of a mysterious signal broadcasting to the depths of space. Act Three opens on the spaceship Discovery, and on three new characters: the astronauts Dave Bowman and Frank Poole, and the ship’s computer Hal 9000. (There are other crew members, asleep in suspended animation.) They’re accompanied by a new piece of music: Carpet Weavers from the suite to the ballet Gayane, by Aram Khachaturian. Carpet Weavers is a sort of leitmotif for the mission, for the shared isolation of a couple of lives lived on a long journey in space. It starts with a slow, lonely melody, the type of melody that could lead a call-and-response, if only anyone would respond. When a second melody joins, you’d expect it to meld with the first as a duet. It doesn’t. Instead, both melodies drift, near each other but unaware of each other; adjacent, not together. A third melody joins, but in the same way. All three melodies wander, alone in the same space. One lonely melody, then two, then three. On the ship, there are three characters, then two, then one. The first time we hear Carpet Weavers, Kubrick inserts a subtle cut: although it feels like the full piece, about a minute of music is missing from the middle. You’ll hear the cut if you listen for it, the moment you hear the harp; the moment you first see Hal. The harp, of course, has a long-standing association with evil. After the piece ends, Bowman and Poole barely talk to each other. They mostly interact with Hal. The second time Carpet Weavers is played is the only scene in the film with accompaniment music and dialogue at the same time. We watch a day in Poole’s life, including a conversation with his parents. The scene also mixes music and music: his parents sing Happy Birthday to him, out of tune with the soundtrack and with each other. Though he’s in space, his work is mundane. The music makes it melancholy. The second time, Carpet Weavers is cut differently: the middle remains, but the end is gone. Kubrick couldn’t develop his leitmotifs like a composer, by changing the key or the tempo or the harmony or the orchestration. But he could develop them like a filmmaker: by cutting. Changing the ending of a piece changes the meaning. This time, Carpet Weavers lingers on a plaintive phrase: the violins draw out the final note, aching to continue. It’s like an unanswered question, and it’s the last note we hear for twenty-one minutes, until the intermission. The overture returns after the intermission: Atmosphères plays again over a black screen. It’s the start of the piece again, though we hear a little less of it this time around. There’s still a big musical event to come, and as well as setting the mood for the second half of the film, replaying the overture makes it fresher in the memory when that moment arrives. Versions of the film that omit the intermission leave out the overture to the second half as well, making a continuous forty-six minutes with no music, little dialogue, and most of the background noise made up of different kinds of silence. The bulk of the plot of the film takes place during the long silence, before and after the intermission. Hal murders Frank and the sleeping crew, and attempts to lock Dave out of the ship. Dave makes his way to the centre of the ship and shuts Hal down. 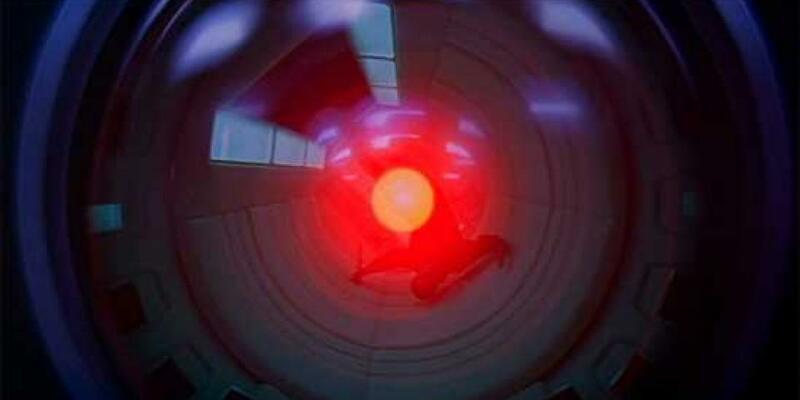 And as Hal’s mind goes, Dave asks him to sing. Hal calls the song Daisy (it’s called Daisy Bell). It’s a cheesy nineteenth-century pop song by Henry Dacre, used by IBM in 1961 to demonstrate speech synthesis. The song works beautifully with Hal’s slow shutdown: as the pitch of the melody rises, the pitch of Hal’s voice drops, cancelling out the tune. It’s a musical flatline. After Hal’s quiet death, with echoes of the simple human song lingering, as words across the screen announce the next act, “Jupiter and Beyond the Infinite”, Kyrie returns like a cold wind. For the third time, the music heralds the appearance of the monolith: the slab floats at the heart of a Jovian syzygy. Now we hear almost all of Kyrie. Earlier, Kubrick developed the leitmotifs of Carpet Weavers and The Blue Danube by cutting them. Now he does the opposite: as the planetary alignment completes and the Discovery draws close, Kubrick simply lets the music run its course. And what a course. The choir is singing the words “Kyrie eleison.” It’s from the Bible, Latin for “Lord, have mercy,” and it’s been set by some very well–known composers. Every setting reflects religious and musical ideas from its time, but for my money, Ligeti’s alone evokes the awe and majesty and cosmic terror of a force beyond human comprehension—one that may grant mercy, or may not. It builds and bends, growing tenser seemingly without limits. But before it ends, Kubrick cuts it, without transition or pause, to another work. It’s music that we’ve heard before, twice, in darkness. In Atmosphères, Ligeti wanted to show what happened when you removed three of the principal ingredients of music: harmony, melody, and rhythm. The work is made from timbre alone, a series of connected atmospheres. It doesn’t play so much as it hums and whistles and growls and glistens. There are few transitions, or maybe it’s all transition; atmospheres flow into each other. Like the music, the visuals are about experience, not narrative. Things change slowly, types of image becoming more or less frequent. Beams of light, gelatinous shapes, alien landscapes appear. With music and visuals, there’s constant momentum but little awareness of time. It was for me as perfect a visual fantasy, with the speed, with the colour and light changes, when the spaceship goes down on a moon of the Jupiter, and the speed is more and more and more. It was very clear that [while] Dr Einstein [theorised] that light velocity was the highest, that you cannot go beyond, […] in this film it was suggested as if it would be beyond the speed of light, and then we enter in another world. Atmosphères doesn’t quite get a full performance. There are a few well-hidden cuts in the middle, and instead of playing the end, Kubrick loops the music back to a much earlier point. As the ship lands, it cross-fades with a fourth Ligeti work, Aventures. Even if you’ve seen the film a dozen times, this is one you might not notice on the soundtrack, if you don’t know it. It’s written for three voices and seven instrumentalists, and the vocalists whisper, shout, sing, shriek, hiss, laugh, sometimes clearly, sometimes catching sounds in their teeth or throats. Where Atmosphères broke down music to floating timbre, Aventures breaks down language to floating consonants. The background is silence and shimmering dissonance. Isolated vocalisations perforate the air. 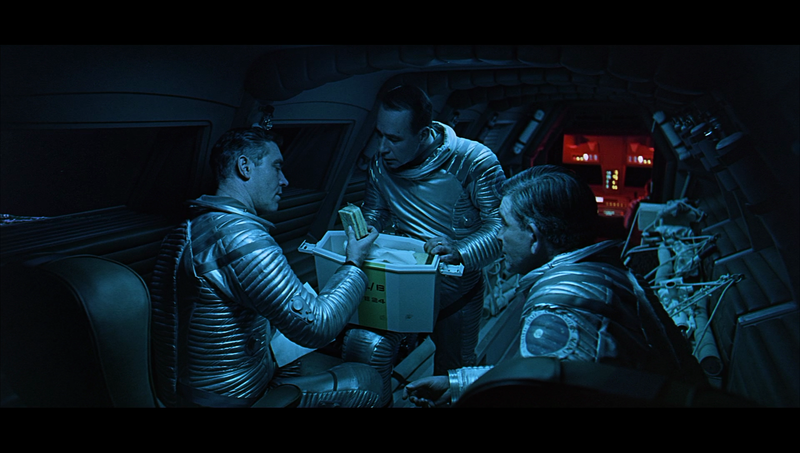 For the penultimate scene, in which Bowman watches himself living out his life in an alien apartment, Kubrick manipulated Aventures heavily and unsubtly. (This, along with the inexplicable omission of the work from the end credits, contributed to a lawsuit from Ligeti, which I’ll discuss in a future post, and which Julia Heimerdinger discusses in detail in an article for the Journal of Film Music.) The already strange vocalisations are further distorted: pitches are bent, sections cut. Like Kyrie all the way back in Act One, it’s unclear whether the music is accompaniment to the scene or whether it’s in diegesis. Voices and sounds seem sometimes to drift in the background, sometimes to whisper from inside the plumbing. At times, it feels like whoever brought Bowman to the apartment is trying to communicate with him. Ligeti wrote Aventures to dismantle language; Kubrick uses it to construct one. Aventures doesn’t have a dramatic or even noticeable ending in the film. It just recedes until it isn’t there any more, and most of the scene plays out in silence. Only in the last couple of shots, as the monolith reappears, does music return. It’s not Kyrie for the monolith this time, but Thus Spake Zarathustra—the vast, majestic opening that we haven’t heard for over two hours. The camera looks straight at the monolith, slowly moving in until it fills the screen at the moment the first C major chord hits. Thus Spake Zarathustra is a leitmotif for human evolution in the film, but there’s something more happening here. All along, Ligeti’s music has been connected in one way or another with mysterious new frontiers: Kyrie for the monolith; Lux Aeterna for the journey to the dark side of the moon; Atmosphères for the Star Gate; Aventures for the alien apartment. The fact that Ligeti’s music isn’t used here suggests that, while we may still not understand the monolith, David Bowman does. Zarathustra plays over the last shot of the film, reaching its grand climax as Bowman floats over the Earth, reborn as the Star Child. The last piece of music in the film, over the end credits, is The Blue Danube. The whole waltz is played, from start to finish (well, the introduction is missing), and after all that’s come in the last half hour, it feels jarringly conventional. 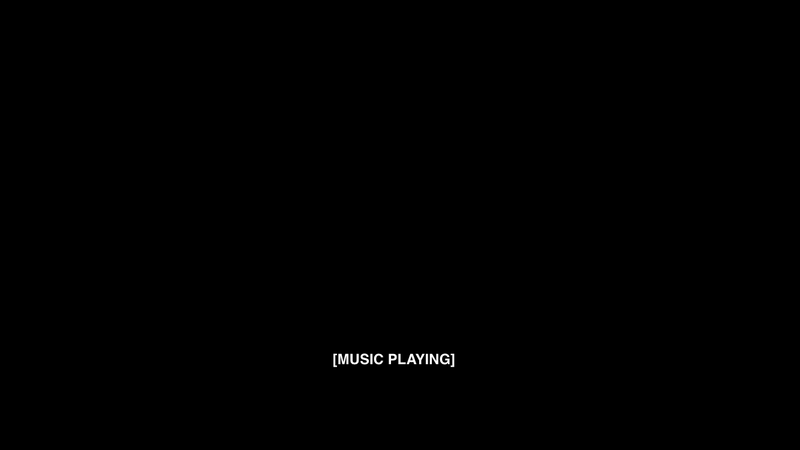 As a sort of book-end to the film, to counterbalance the music from the overture and the interlude, the last four minutes and twenty seconds play over a black screen, after the words “The End”. Why Kubrick decided to end on music that he’d used as a leitmotif for the dance of the spacecraft is anybody’s guess—whether he meant anything at all by it, or liked the idea of turning back to the piece that represented turning, or maybe he just liked it as a closer. Stanley Kubrick was a curious, eager, interested listener, but had little expertise in music. It’s unlikely he thought of, say, the wandering, lonely melodies in Carpet Weavers as proxies for the characters on the Discovery, or the three great climaxes of Thus Spake Zarathustra representing the three heavenly bodies at the opening. Not many people think of music so literally, but the parallels are there all the same. Kubrick was often seen as a coldly logical director, but his choices of music were instinctive. And his instincts were excellent. 2001 showed a new means of creating a film score, using existing music as an equal partner, edited into and along with the film. It’s a method that very few directors would imitate, but one that Kubrick used for the rest of his career. In 2001, he developed the muscles he needed for his unorthodox approach to film scoring. In his next film, he’d start to flex them.